Exciting meeting at HOD Speakers this week. 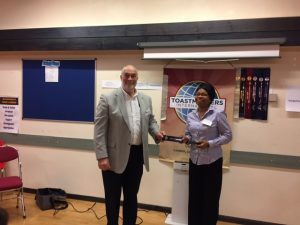 First time Toastmaster of the Evening, Paschorina Morty, thoroughly prepared and researched, subtly and confidently in charge and in control, creating a solid space of formality, in which the creative energy, irreverent fun and always inspiring variety of speeches had room to blossom. Do you fancy being on the HOD committee for 2017/18? 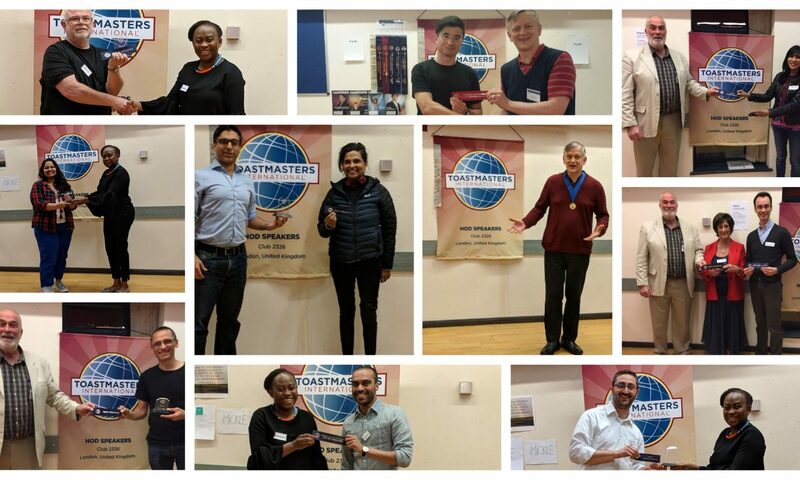 You may know that the Toastmasters International year runs from July 1 to June 30, so from July 1 the new committee will take over. Are you interested in being on the new committee? if you are interested but not sure what some of the roles entail here is some information on the roles and responsibilities. if you would like to take one of these positions please let Gill or Elsa know. Hark now hear the cricket toast! The meeting on April 20 at HOD was a normal mix of fascinating, entertaining and slightly strange ! 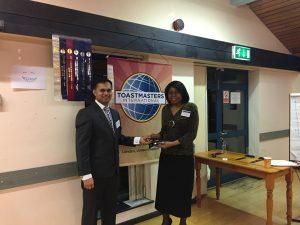 The whole night was organised and given an efficient flow with the debut of Jo in the TME (Toastmaster of the Evening) role, and she did a superb job and you would never have guessed she’d never done this role previously. Nike delivered her HPL (High Performance Leadership) speech outlaying her plans for what she’ll be doing to achieve this award. This was evaluated in her normal insightful way by Gill. 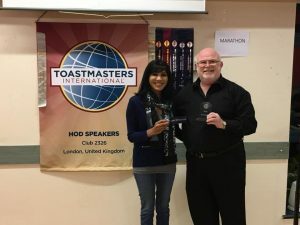 Karl delivered a very humorous icebreaker speech for which he received the best speaker award of the night and was evaluated by Angela Hook. As usual there were a wide variety of speeches at this weeks meeting. Jo delivered a speech titled “It is none of your business’ as the 2nd project in the competent communication manual that was evaluated by Steffy. For the fifth month in a row HOD held a third meeting of the month to cope with the demand for speaking opportunities from our ever growing membership. 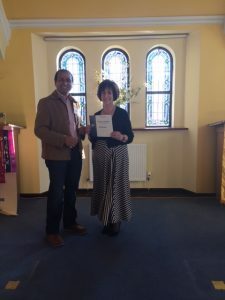 In a change to the regular format there were 5 speeches and a reduced table topics session. 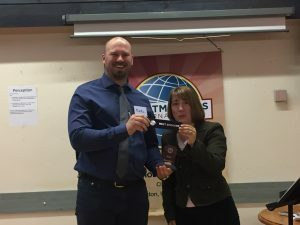 On Saturday March 25 the area final was held at Watford speakers club for the International Speech contest and Evaluation contest.